„We are witnessing a genocide caused by European selfishness,“ said Palermo mayor Leoluca Orlando as the Irish navy ship LE Niamh docked in the port carrying some 370 survivors of Wednesday’s disaster and 25 corpses, including three children, according to REUTERS. The LE Niamh was the first ship being on spot of the accident on Wednesday at the Libyan coast and had taken most people. Some of those rescued, who needed medical assistance, had been previously brought by helicopter to Italy. According to media reports the refugees came from Syria, Eritrea, Sudan, Somalia and Bangladesh. The drama caused again criticism of the recent efforts of the EU states to rescue refugees in the Mediterranean Sea. „There must be better ways, so that refugees do not have to risk their lives to reach Europe“, demanded Melissa Fleming, spokeswoman for the UN refugee agency UNHCR. But Europe still don’t have a clue how to handle the situation. And so the life of thousands of people is in danger by bureaucracy and publicity-seeking actionism of single politicians. David Cameron and François Hollande both opposed recent proposals by the European commission president, Jean-Claude Juncker, to put in place a fairer EU-wide system for resettling asylum seekers landing in Greece and Italy. The present European asylum and migration system is based on the Dublin regulation, which forces asylum applications to be made in the first country of entry. And these are EU countries with external borders like Italy and Greece. 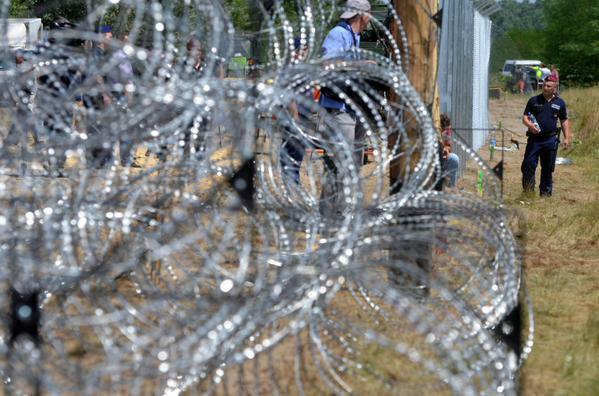 But instead to find an European wide solution the Hungarian president, Viktor Orbán, is planning to build a four-metre-high wall on the border separating his country from Serbia, meanwhile the British and French governments plan to build another wall in Calais. European politician seem not to learn from history: Walls are never a solution!